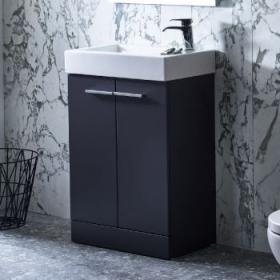 Kobe is available in diiferent styles to suit your needs; whether it is a choice of wall mounted or freestanding 450mm wide cloakroom units or the more generous 560mm or 700mm sizes units, perfect for larger bathrooms. Available in gloss white, storm grey and walnut. Kobe doors are fitted with soft close mechanisms to give controlled and quiet closure. All Tavistock furniture is made from the very best quality materials and manufacturing techniques and offer a 10 year guarantee on all furniture units.